In the list below are all of our frequently asked questions. How can we locate our driver upon arrival? Please note that one of our drivers will be waiting for you in the arrivals hall of the airport, upon exit of customs, holding up a sign stating your name and your destination. The transfer with Pick Up at the Airport includes 45 minutes wait. Any additional time will be charged at the standard hourly rate. In case you loose your luggage please come outside to advise your driver so that he does not leave without you, and you do not incur any extra costs . The customs police will allow you to re-enter the lost and found zone. I will ensure that either myself or one of the drivers will be waiting for you in the arrivals hall of the train station, at the beginning of the track , when your train arrives, holding up a sign stating your name and your destination. The transfer with Pick Up at the Train Station includes 30 minutes wait. Any additional time will be charged at the standard hourly rate. NB: Clients traveling to the Naples train station: PLEASE GET OFF THE TRAIN AT NAPLES CENTRALE (ALSO KNOWN AS PIAZZA GARIBALDI), we will wait for you there. Napoli Centrale is the last stop for the city of Naples. Port: Your driver will wait for you in front of the ship gangway, showing a sign with your name on it. Hotel: Your driver will wait for you in the hall of your hotel. Please note: some small hotels do not have parking space outside, in this case where possible we ask you to be punctual and to wait by the entrance, in this way your driver can stop for a few seconds. Private apartments or Villas: Please wait for your driver on the main road. Any specific requests for collection details must be made at the time of booking. 0039 334 3328300 – 0039 329 6684537. NO DEPOSIT WILL BE CHARGED . Written notice must be received by us via fax/email at least 5 days prior to the date of the reservation, in case of cancellation or any change to a booking. In case of NO SHOW or LATE CANCELLATION (less than 5 days prior to the date of the reservation) there will be a charge of the total quoted price of service/s booked. Barbaro Car Service will not be held liable for missed flights. Our drivers have the right to refuse any passenger who has excess luggage which would result in the car being unsafe to drive (please make sure you book the appropriate type of vehicle, e.g. Sedan, Minivan, etc). Payments must be made in Euro " Cash " ON THE DAY OF THE SERVICE. We take the credit card details purely for guarantee purposes, the credit card provided will not be charged at anytime. If the ship does not arrive into the port, this would not have been the client's fault. However, the tour will be automatically re-scheduled once the boat is in the port, if you are still on board of course. A fee would be charged if the Tours or Transfers was cancelled for any other reason within the 5 day cancellation period. How much should we tip the driver? Is the tip included in the quote? Tip is not included in the quote. Gratuities are not mandatory in Italy , however we do feel that if the clients have been happy with their service, the driver should receive a tip as a token of appreciation. Standard gratuities in Europe run between 10 % - 25% depending on the service received. How can I book a service? Can I book online? YES. We have now made it so that you can book Shore Excursions, Tours and Transfers online directly through our website. Payments can be made in the cash at the end of each service. Your credit card cannot be used as final payment, but you can use to make a prepayment through PayPal service. Rates include: all taxes, vehicle and English speaking driver, tolls, car fuel and parking. Rates exclude: lunch, entrance tickets and private guides. What is the difference between a tour guide and a driver-guide? For those of you who are booking private tours for the first time, perhaps a little clarification would help. A tour driver and a tour guide are not the same. It is to your advantage when booking a private tour to be sure that you understand the difference and know in advance what you are paying for. A tour guide has a license, usually issued by the state / country. He or she has attended school to learn all about the sites you will see. A guide is permitted to go into the historical sites with you and tell you about the history. Naturally, their services will cost more. A tour driver is not licensed, has not attended "guide" school, and is not permitted inside the site to tell you about the history. Naturally, their services will be more economical. Many drivers are just as well versed in the area history as the guides. I didn't get your email yet!!! Why? or phone us on + 39 334 3328300 or +39 329 6684537. 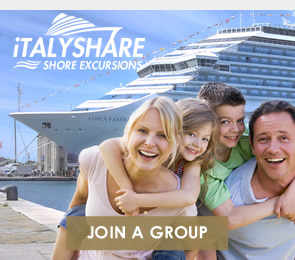 BARBARO TOUR SHARING - Share a small group tour in Italy, save money and make new friends.